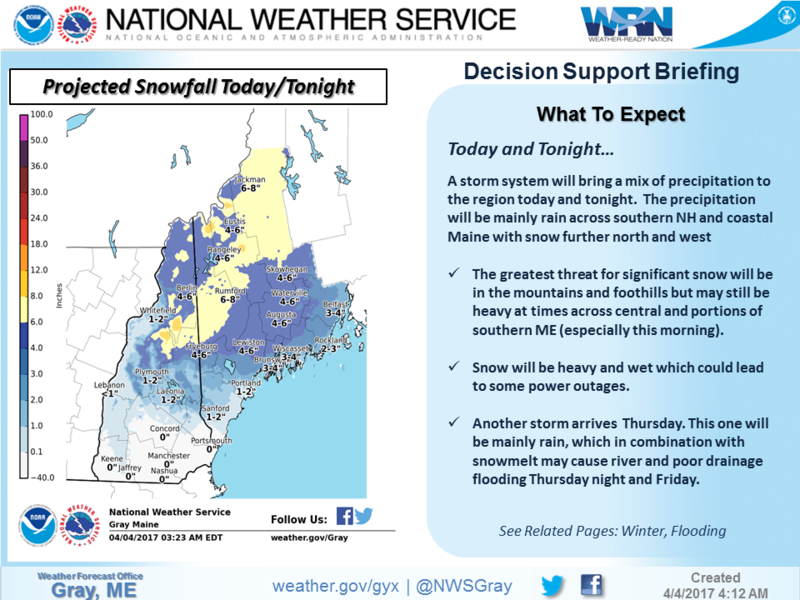 Maine could even get some more snow this week. Yesterday, the sun did a great job letting us enjoy it and providing a spectacular backdrop to the first win of the Red Sox season. Today the sun is taking a break and it’s going to be off for much of the rest of the week and into the weekend. It’s chilly all day with periods of rain and even wet snow inland. It looks like half an inch to an inch and a half of rain. The heaviest will be over southern areas. The map below from NOAA in Gray gives an idea of who will see the most snow. These numbers are for snow on the grass and existing snow. There will be less on the roads, which are warmer from the sunshine on Monday. There could be some tree damage and subsequent power outages. The winds today are going to add to the nastiness of it all with a gusty breeze off the water. The wind won’t be terribly strong, but noticeable. The rain ends this evening and while tomorrow won’t see any significant precipitation, there could be some light drizzle or showers, especially early. Temperatures continue to be low — only in the 40s. The Red Sox game should be fine Wednesday. Thursday is a different story. Downpours may very well create a washout for the Sox game and other outdoor plans. Another 1 to 2 inches of rain is on the way. This is the final storm in this series, which will have all but wiped out the drought across the region. Friday is still cloudy and cool with a few showers, but improvement does arrive Saturday with some sunshine and seasonable temperatures. The real good stuff comes Sunday and Monday, when temperatures should make it into the upper 50s and even lower 60s over interior York and Cumberland counties. After all this water and cool weather, several days of warmth will begin the process of things greening up as the April showers do their thing.